Yes, spruce beer, beer made with branches off of trees. I must admit, this was a unique experience. This is not an everyday, run of the mill beer. Spruce beer was a beer from nacessity, made by the first settlers in the New World with what they had on hand. Since they didn’t have hop yards planted yet they used spruce and fir tips to bitter their beer. Since I was able to purchase this beer directly from the brewery I was able to chat with the shopkeeper about the beer. He told me that in past years this beer was sometimes a bit too sweet or too sprucy, but this year (2013) they hit the balance. After drinking this beer I can see how the balance could drift either way, with the sweetness or spruciness becoming dominate. Dark brown with deep ruby highlights. Only a slight head. Like a sweet forest, if that makes sense. Sweet molasses mixed with spruce/fir and hints of dark fruit. Not as much of the spruce as I expected, though it is there for sure. The sweetness comes on strong in the back. Almost a bit mediciny. Some dark fruit/date notes. Full body with a moderate amount of carbonation. A bit sticky. A unique experience. 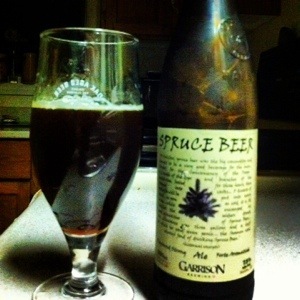 Not so dominated by the spruce as I expected and sweeter than my normal taste. Something that is worth trying but I couldn’t imagine having more than one in a sitting. For uniqueness, if nothing else.